A 4/3 fullsuit is in my opinion the most versatile wetsuit – its thickness covers all the commonly surfed temperatures. 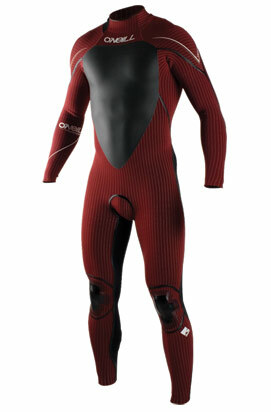 If water is to cold for a 4/3 wetsuit then we are talking some really cold water that is no longer for just anyone. A 4/3 full wetsuit – fullsuit covers your whole body except your head, hands and feet. The numbers 4/3 represent the thickness of neoprene used in this wetsuit. 4 stands for 4 millimeters and 3 stands for 3 millimeters. This means that a 4/3 wetsuit is made from neoprene of two different thicknesses, the thicker one is usually used on the body and legs and the thinner is used on the arms and crotch area. The reason for this is improved flexibility of the wetsuit. Thicker neoprene keeps your core warmer while thinner neoprene allows for more flexibility where you need it. A 4/3 wetsuit is a winter wetsuit. If you wear it together with wetsuit boots, wetsuit gloves and a neoprene hood you can use it anywhere down to 50F (10C). This is not a firm number though; there are many things that influence at what temperature a wetsuit can be used so check our wetsuit thickness and water temperature guide to find out more. Stretchy neoprene – 4/3 is already a thickness of neoprene that will noticeably slow you down while paddling, so get a wetsuit that is made out of stretchy elastic neoprene to make it more flexible. Very helpful. I wanted to educate myself re: wetsuits, as I will be buying one for my husband and for me. Thanks! Great advice. Much appreciated, thank you!